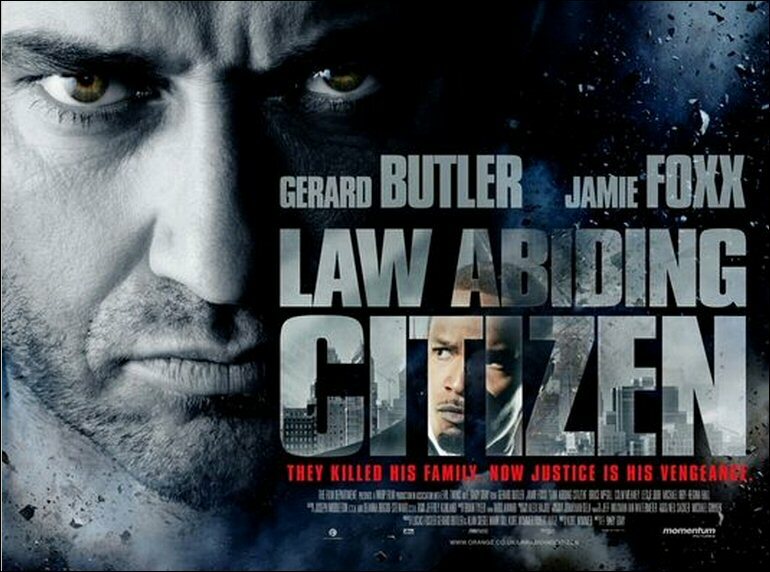 While simply looking after his daughter and getting ready for the family meal a door bell rings and Clyde Shelton (Gerard Butler) answers the door only to get attacking by two men restrained and beaten the men move into the house killing his wife and young daughter. Clarence Darby (Christian Stolte) and Rupert Ames (Josh Stewart) are caught and taken to a trial. Hot shot lawyer Nick Rice (Jamie Foxx) is offered a deal which gives him his guarantee success rate which is all that matters to him. This deal with Clarence means Rupert is put to death while he goes free after three years in jail. Clyde is less than impressed but has little choice but to accept. Ten years down the line Rupert Ames is about to be executed and Nick and his mentor Jonas Cantrell (Bruce McGill) and his new apprentice Sarah Lowell (Leslie Bibb) all go to view, only something goes wrong leading to a less human death for Ames. The police go after Clarence thinking he might know or be involved in the crime only for him to be given an escape by a mystery police man who turned out to be Clyde. Clyde ends up butchering Clarence and filming it. Police then arrest Clyde Nick questions Clyde only for Clyde to use a play on words to sound guilty but never actually admitting anything. The Tape Clyde filmed was sent to Nicks Family his wife Kelly (Regina Hall) and daughter Denise (Emerald-Angel Young) who watch it only for the tape to reveal no image of the murderer. On to the bail hearing where Clyde gets Judge Laura Burch (Annie Corley) to grant bail with legal material he has learnt himself. Only to laugh and shove it in her face question how they can let someone accused of murder free. Clyde is now in jail waiting for trial but starts offering deals to Nick if these deals are not met people involved in the original case will die, will Nick continue to take the deals or not? who will be the ones to suffer for Nick’s pride and Clyde revenge. The Story will keep you on the edge of your seat and also keep you question who to cheer for as Nick is by the book not getting hands dirty guy while Clyde is trying to bring the justice system down so there are no more deals. I personally cheer for Clyde as his character sums up the feeling anyone who had something similar happen to them would drive them to the edge.